Chicken Pot Pie - Good ole comfort food! 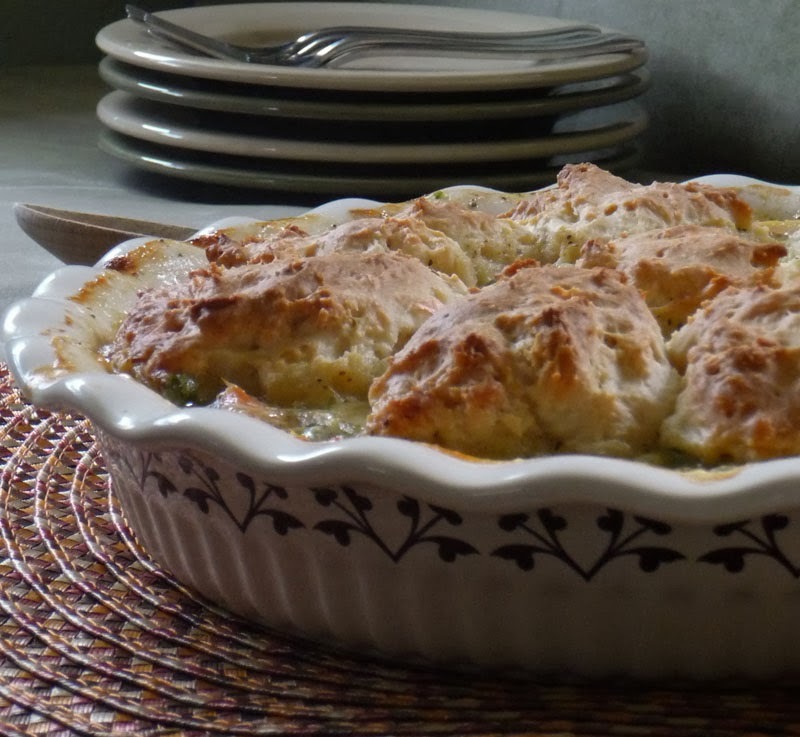 This is definitely a family favorite, but we had to eat a lot of bad Chicken Pot Pie to get to this recipe! I made the tried and true recipe on the biscuit mix box, and that was fine for years...until we branched out and tried Ms Paula Deen's recipe I saw on TV. There was no going back after that! Ms Deen's recipe is rich and delicious for sure, but it was almost too rich for me. Is it possible for chicken pot pie to be too rich? Apparently I think so, but what do I know? I'm also not a huge fan of a pastry or pie crust topping. What can I say there is clearly something wrong with me, but I just love a biscuit topping! Nothing beats a homemade biscuit topping! After lots of experimenting and tweaking, the Myers family feels this is the best darn Chicken Pot Pie we've ever eaten. What sets this recipe apart is the Roasted Chicken. It really adds that extra dash of deliciousness! I encourage you to adjust the seasonings to your liking. 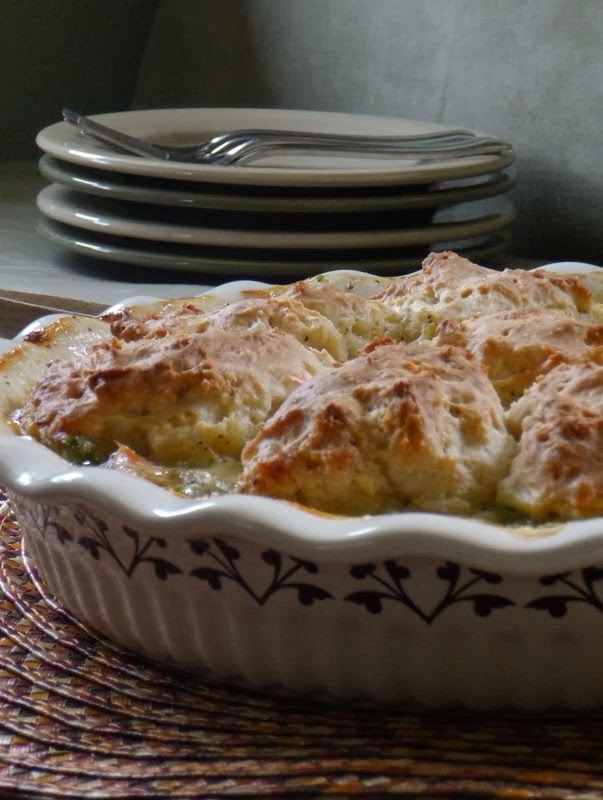 This recipe is very adaptable and oh soooo comforting. Prepare the Roasted Chicken Breasts. Tip - I like to make the chicken breasts the night before. I always make extra and enjoy a Roasted Chicken dinner and save 2 chicken breasts for my Chicken Pot Pie the next night. When ready to make the Chicken Pot Pie, melt 1/3 cup butter in a saucepan over medium heat. Add 1 cup carrots and cook until they start to soften (between 3-5 minutes). Then add 1/2 cup chopped celery, 1/3 cup chopped onion, and 1 cup frozen peas. Cook until veggies are tender. Add 1/3 cup flour, 1/2 teaspoon salt, 1/4 teaspoon black pepper, and 1/4 teaspoon celery seed. Slowly stir in 1 3/4 cups water and 2/3 cups milk. Add 2 teaspoons chicken base, and reduce the heat to mid-low. Simmer until thickened. Remove the chicken meat from the bones and cut into bite sized pieces. Add chicken to the veggie mixture. Don't be afraid to toss the skin in there too! It adds great flavor! Pour the thickened chicken and veggies into your baking dish. I like to use a deep pie or casserole dish. Preheat your oven to 425 degrees F. Prepare the biscuit dough as directed on allrecipes.com. If the dough is sticky you can just do these as drop biscuits (I did). Pull some dough off and form it into a ball of sorts and set on your pot pie mixture. Space them around the top of your pie evenly. Depending on the size of your dish they might not cover the entire pie. It's okay. These biscuits plump up quite a bit. Don't be afraid to leave these in a little longer if needed. Nobody likes uncooked biscuit dough even if the biscuits are super tasty! I always lift up the biggest biscuit just to make sure it is cooked all the way through before I take them out of the oven. Once the biscuits are cooked through, remove from oven and let rest for 10 to 15 minutes. Serve and enjoy! There's nothing more satisfying than being able to provide comfort food to your babies when they aren't feeling well. Poor thing! You are a great mom and this looks perfect!